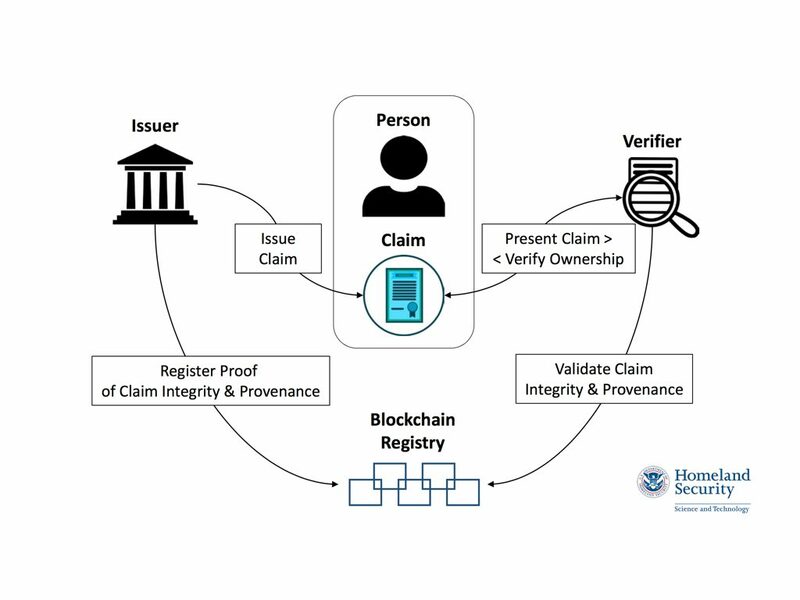 The Future of Property Rights a program at New America just published a new report The Nail Finds a Hammer: Self-Sovereign Identity, Design Principles and Property Rights in the Developing World. I commented extensively on the paper before publication and they included the Domains of Identity within the report. It turns out that many of the Domains of Identity include registries. This whole perspective that registries as the root of many of our systems is very eye opening. Just like when one finds identity one sees it everywhere, it turns our registries are everywhere too. Mike invited some key contributors to the paper to talk at New America. I presented about both Self-Sovereign Identity AND the domains of Identity … enjoy!!! I was asked to substitute in at the last minuet to talk about the difference between blockchain and cryptocurrency at the BridgeSF conference on their Enterprise Day. 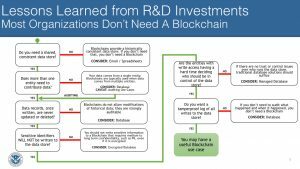 Do You Need a Blockchain. 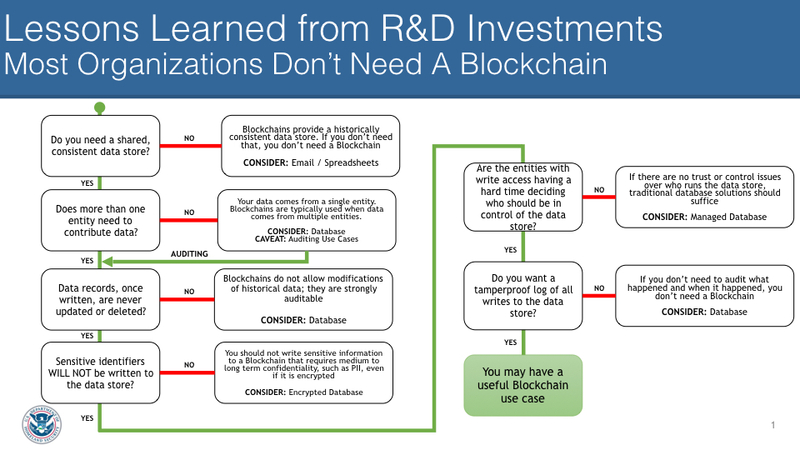 This slide is from DHS S&T and Anil John who is leading research int his area for that agency. Verifiable Organizations Network, Led by the British Columbia Government on GitHub. Built on the Hyperleder Indy Code also on GitHub. Verifiable Credentials Work at the W3C. Decentralized Identifier Work at the W3C building on work from the Internet Identity Workshop and Rebooting the Web of Trust. Slide from Anil John DHS S&T explaining Verified Claims. The Known Traveller : Unlocking the potential of digital identity for secure seamless travel. World Economic Forum Report. Crossing the boarder involves many parties. The United States and Canadian Government are collaborating in exploring how to improving boarder crossing and customs clearance. Joining the Community to engage further. If you want to get the Scoop on Self-Sovereign Identity you can get that here! Tim Bouma wrote a post about Trusted Digital Identity. Identifier: Anything (name, numbers, symbols, etc.) that uniquely distinguishes a member of a population from another member. Part of Tim’s definition resonates with a conversation I had with Jean Russel in 2009 that I thought I would share that to support a very nuanced and specific conversation about what identifier actually are and how they work in the physical world and digital world. This complements the Identifiers: A Field Guide post. Kaliya and Jean Russell share a dialogue, learning from each other about reputations and currency. (I write in third person because I want to attribute appropriately to each, and yet this is done together). We have a sense of the overall map of ideas, and we want to start with some core concepts that the work depends upon. We begin with identifiers. We discuss below what identifiers are and how they work in meat-space. Our next post covers identifiers in the digital context. Jean: SO….What is an identifier? Jean: A pointer to a person or an object? Jean: So a word can be an identifier? Kaliya: Yes. To have a more specific identifier “the green chair over in the corner” identifies it (the specific green chair) …relative to others in the same context – a room, for example. Jean: Okay, I think I get what you mean by pointer. An identifier allows you to identify something to someone else in a shared context. Kaliya: Yes. So people’s names identify them in our shared social spaces. They are identifiers too. Jean: So in meat-space we are using identifiers all the time when we use language together. Kaliya: However, I am not my name, I have a name – it points to me. You have a name – it points to you. Jean: Okay, so the name and what it refers to are not the same thing. One is pointing at the other. And there are different kinds of identifiers, then? 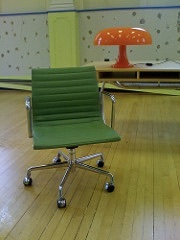 Like chair is vague and green chair in the corner is specific and my name is specific to me, pretty much. Kaliya: Chair is a generic identifier, yes. Well, it is specific to you in a social context. Green chair in the corner is more specific. I might want to identify a very particular green chair. I would look on the chair to find the manufacture serial number for it, or I might want it in my company/personal inventory and “assign” it a number identifier for that specific chair. Jean: Right, so there are degrees of specificity in identifiers. Kaliya: So people’s name are specific in a social context. They might be more or less “specific” because there is more than one person named Jean in the world and even with my name there is more then one Kaliya. But in my social world – the people I know – I am the only Kaliya. I know several Mary’s though so I have to get more specific when talking about them using a last initial or a last name. Jean: Okay, so there is an element of uniqueness that is important in an identifier? To successfully identify the object, the identifier needs to be unique? Kaliya: Yes, unique within the context. Jean: So we seem to navigate this pretty well in our everyday lives, and we ask for more specificity when we need it. Jean: Can you explain what identifiers mean in the digital environment? Kaliya: So, when I am at a dinner party with two Mary’s and having a conversation you signal who you are talking to/about via gestures and stuff – you layer in more info about who you are talking about. Or you might, in a conversation in digital chat, say “Mary R” or “Mary H” because you don’t have bodies and social gestures to layer in. So when we go into digital realm – on the internet, what is the context we are in. So when someone goes to a website and gets an account, they get a username. Jean: Right, I do that all the time. What does that mean? Kaliya: The site – often checks to see if anyone else has that username, if they do…you can’t have it because someone else has “that” identifier already. Jean: So I might be able to get ‘Jean Russell’ on one site but not on another, for example? Kaliya: In a way, identifiers for people are like digital bodies, but they were weird cause they wouldn’t let you bring a “body” from another site/context into their site/context. Jean: Every site you went to – every new site – they would make you get a new “body” a new identifier for that site. Ah… I don’t want to keep track of all those bodies. This is so annoying. I am one person. I want my name to be the same regardless of what site I am on. Kaliya: Well yes – exactly, so the question is how do you have a unique identifier, that “works” for you across the whole internet. This is what OpenID does. It creates a way for you prove you “own” or “have control of” (as in knowing the password for an account). You need to be Unique within a bigger context then just that website, so the large sites allow users to take the identifier within their space and use it other places. So you can use your Yahoo! ID or MySpace ID and log into other websites. OR you could go and buy a domain name just for you – and use it. So I own http://www.kaliya.net and it is set up so that I can use it as my open ID. Kaliya: You are just JeanRussell within that context – that website. Identifiers in the digital world, to be effective – need to be unique globally. URLs are all Unique. There is a name space….and domain names – are unique, a global registry, makes sure that no two people/companies/organizations own the same domain name. Jean: Kaliya, we left off our last chat talking about digital bodies and the importance of context with identifiers. Can you say more about digital bodies? Kaliya: Well lets start with physical bodies – we have just one of these. So when we walk around in physical space people recognize us because we are in the same body we were last time. We only get one and over time is ages but basically it doesn’t fundamentally change and we can’t “get another one.” Last time we talked about identifiers and having the ability to have a globally unique one that you could take with you around the web. This gives you a freedom to move between websites and take your “digital body” with you. The difference is that in digital space you could make yourself several different “digital bodies or identifiers” that were globally unique that you would use in different contexts. Jean: I am already a second body by creating the first digital body, right? Since it isn’t my physical body? Jean: So having many bodies is even more to keep track of and create? Kaliya: The digital identifier you create that points at you – is like another digital body. Maybe you want to just be http://www.jeanrussell.com everywhere on the web. Maybe you want to have a professional life “identifier” and a personal life “identifier” that separates those two aspects. Jean: You mean I can manage those bodies instead of having each platform define them for me? Kaliya: Yes. An example that was brought up yesterday here at Super Nova by danah boyd was that of a teacher. That a teacher is working in front of children – they can’t be seen to be sexual (having a normal dating life) or drinking alcohol (as a normal social adult). So this is an example where someone in that profession would create an identifier they use to connect to their students on social networks and comment on blogs etc. Jean: Right. That makes sense. Even in my physical body in the analog world, I am showing different facets of myself in different contexts. Kaliya: They need to have a different identifier they use for their social connections to other adults – in their dating/social life. That same teacher might be politically active – as they have a right as a private citizen to be and those political views well within the spectrum of points of view that are acceptable might not be “the same” as those in their particular town or neighborhood – say a strong environmentalist in a very coal producing town. So they want to take action and voice opinions and share with others who are other active citizens. They would need a different digital identifier for that. Jean: So, it feels like an advantage to have the ability to manage these digital bodies based on the context they show up in? And thus the community they mesh with in that context? Kaliya: Back to our first conversation it would be great if they didn’t have to get a new identifier each time they went to a different environmental site – a portable one for them within that context of environmental activists. Yes, contextual management is important. The tools to support individuals doing this are just beginning to be conceptualized and developed. Jean: So what I hear you saying Kaliya, is that we need our digital bodies to be a reflection of the facets of ourselves and the intersection of those facets with the communities we participate in. This is not defined by platform as much as it is our practices online. Kaliya: Yes – an we need open standards that give us the freedom to move around the web with identifiers (digital bodies) from one website to another. This has to do with the underlying architecture of the social web that platforms build on. How we use these platforms and tools is complex. To have good practices, we need development of “web” (which had internet below it) and then on top of that is a layer where identifiers are – and applications that use them. then there is an emerging set of standards to move information we generate in social contexts around between sites these are called activity streams. So a website is a context, a group within a site is a context too. Each google group you are in is different – its own cluster of people. Jean: Right, although there might be some overlaps, that can’t be assumed that I want to show the same facet of myself to all of my google groups. Kaliya: There are sort of meta contexts – so a network of environmental activist sites would be an example of that. Kaliya: I guess you can think of it as topic contexts and platform contexts. One of the issues is that most platform contexts do not support being able to switch between different login/handles/identifiers very easily at all. You might have a personal yahoo account and a professional one, on ning too, same deal. Jean: Right, like on twitter, I was working around that by using api clients or using different browsers! Kaliya: Right, or logging in and logging out. Mozilla is working on a project to help people manage their ID’s within the browser. The platforms would like us all to “just have one identity” and not switch between but this is not realistic. Jean: Right, getting back to that teacher example – she may want to be in touch with students on facebook… and want to keep her personal life in a different name there. So we have a social practice for doing that, but the tools don’t yet adequately reflect that. I met Marc Davis at SXSW in 2010, we instantly clicked and began working together. He was on contract to develop pre-reading material for a WEF meeting in the fall about Personal Data. 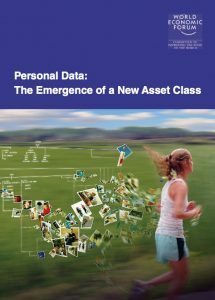 I contributed significantly to the document which became the basis of the first Rethinking Personal Data project Report, Personal Data the Emergence of a New Asset Class. [click on the image to download the report]. Diagrams that appeared in the third report I helped sketch out with Bill Hoffman. Here is the Third WEF report PDF [click on the document image]. WEF Report #3 write up on my Blog. WEF Report #3: Unlocking the Value of Personal Data!